There’s no doubt that LA’s burger game is strong. This is a city of burgers that has everything any burger aficionado could dream of. Gourmet, classic, charbroiled, we have that. Foie gras, truffle, or wine reduction sauce? We have that too. We even have an In-n-Out Burger and a Shake Shack! Yes, we’re the envy of all burger-loving cities. And with so many burger options on every block, and so little time to try them all, we thought we would make it easier on you by giving you a roundup of the best burgers you can only find in Los Angeles. Petit Trois "Le Big Mec"
When asked where to find the best burger in LA, The Big Mec at Petit Trois quickly comes to mind. Just when you thought you saw it all in the burger world, Chef Ludo Lefebvre reinvents it with a burger that looks like it was inspired by French Onion soup. Don't let the absence of lettuce and tomato, and a plate flooded with bordelaise sauce dripping from the two 4-ounce prime beef patties, disqualify this masterpiece from being labeled a burger. This beast of a burger that's topped with American cheese and a garlic aioli is savory and delicious. You’ll also want to sop up all the bordelaise sauce that’s rumored to have foie gras. 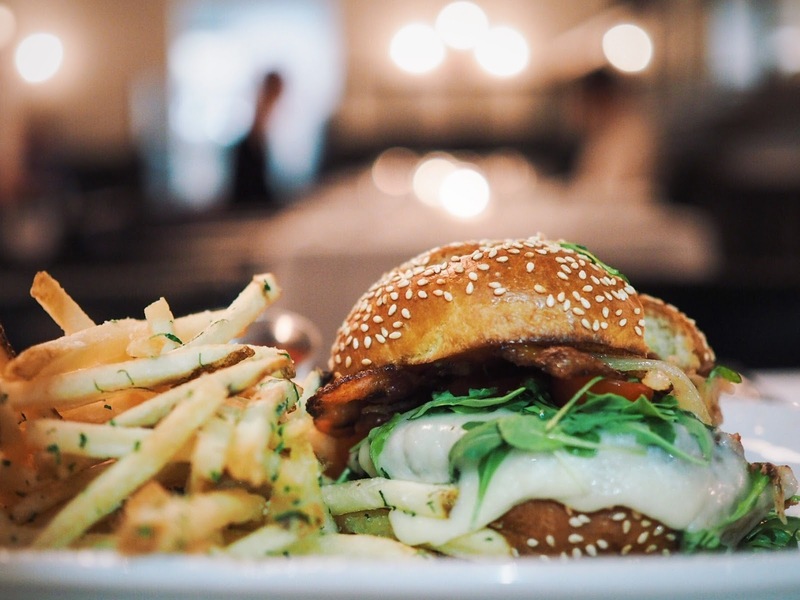 Chef Michael Fiorelli tells it best, but in short, his famous not-so-secret burger came to be when a regular customer kept insisting on ordering a burger when there wasn’t even one on the menu at the time. Chef Michael finally gave in and using what was at hand, created the now famous, Downlow Burger. Using wagyu beef, house-made pickles, caramelized onions, aged cheddar, and a tomato aioli, Chef Michael told him to keep it on the "Downlow" but a burger this good was soon in high demand. If you want to know what a fancy, gourmet version of a Double-Double Animal style would taste like, then check out this burger at Love & Salt. Connie & Ted’s "Bacon Hook Burger"
It might seem strange to order a burger at a place that specializes in New England seafood, but Michael Cimarusti’s Hook Burger is more than just an item to appease the seafood-adverse diner that ended up at Connie & Ted’s. This burger packs a lot of flavor thanks to the thick slice of Hook’s four-year cheddar that’s funky and packs a lot of bite. Upgrade it with Neuske’s bacon, and this burger made with a thick patty of aged-beef, house-made pickles and Thousand Island sauce will be one you come back to. The O.G. of gourmet gastropub burgers, Chef Yang Soon’s Office Burger started the gourmet burger revolution back in 2000. At the time there was no other burger like it in Los Angeles. Dry-aged beef broiled to a medium-rare and topped with blue cheese, caramelized onions and arugula on a garlic buttered roll? Sounded crazy back then when all you had was Fatburger and In-n-Out for your burger options. Also, his non-modification policy was a turn-off to some, but why would you want to mess with a masterpiece? The burger was perfect then and is still perfect now. You may know chef Nyesha Arrington from “Top Chef” and “Knife Fight,” and if you haven’t been to her new restaurant Leona, just a block away from the Venice Pier, you better book a reservation now and go. Dishes like Lamb Belly Wontons, Bulgogi Braised Short Ribs with roasted bone marrow, and black cod in a sweet onion jus, are just a few highlights from her dinner menu. But for lunch and weekend brunch, we’re ordering Le Burger. This French Onion inspired burger is made with a delicious patty of ground short-rib cooked in beef stock and mixed with herbs like oregano and bay leaf. Topped with gruyere, caramelized onions and house pickles on a soft brioche bun, you would be mistaken not ordering this beauty. 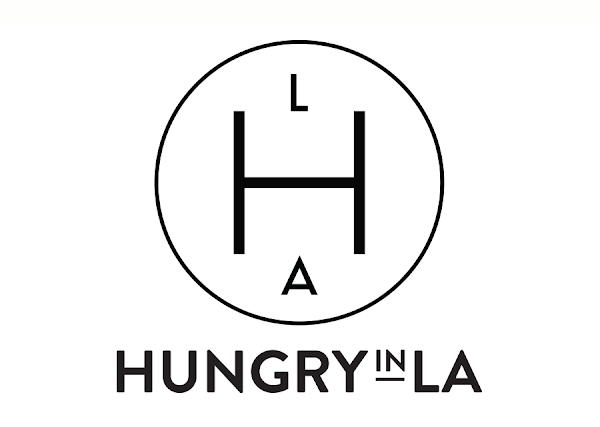 What started off as a pop-up, then morphed into a popular food truck, is now a permanent burger stand in the back of the large Ramirez Liquor Store in Boyle Heights. VaKA Burger is Chef Aaron J. Perez’s vision of delicious gourmet burgers made with the best ingredients from local farms and ranchers. The menu features his elevated take on California classics like the “VaKA” (Bacon Western Cheeseburger), or the “OG” (a tribute to Bob’s Big Boy). But the one burger to get, is The Truff, it's one of the best versions of a truffle burger you’ll find in LA. It all starts with a grass-fed beef patty. The meat is ground in a special way in order to emulsify the fat and create a juicy medium to medium/rare burger with a perfect sear. The addition of white truffle oil, caramelized beer-braised onions, arugula, and roasted garlic aioli, make for one delicious burger. Ox and Son "O&S Burger"
What do you get when you put together a half pound beef patty with raclette cheese, arugula, house-pickled onion, and truffle aioli on a soft and spongey Portuguese bun? A very tasty burger that’s hard to pass up. The O&S Burger at Ox and Son in Santa Monica is huge in size and flavor. Served on a wooden plank with a steak knife, you’ll find yourself in burger ecstasy. The truffle aioli is just enough umami flavor to make the burger savory and delicious without overpowering the beautiful beef flavor of the patty. If you go during the weekend, put an egg on it for brunch. The Tripel "The Tripel Burger"
If you’re a local in-the-know, then you’re already aware of The Tripel’s outstanding menu from owners Chefs Brooke Williamson & Nick Roberts. This quaint gastropub in the laid-back beach community of Playa del Rey, offers delicious food and has a great list of beers to choose from, plus build-your-own-flights is always nice. 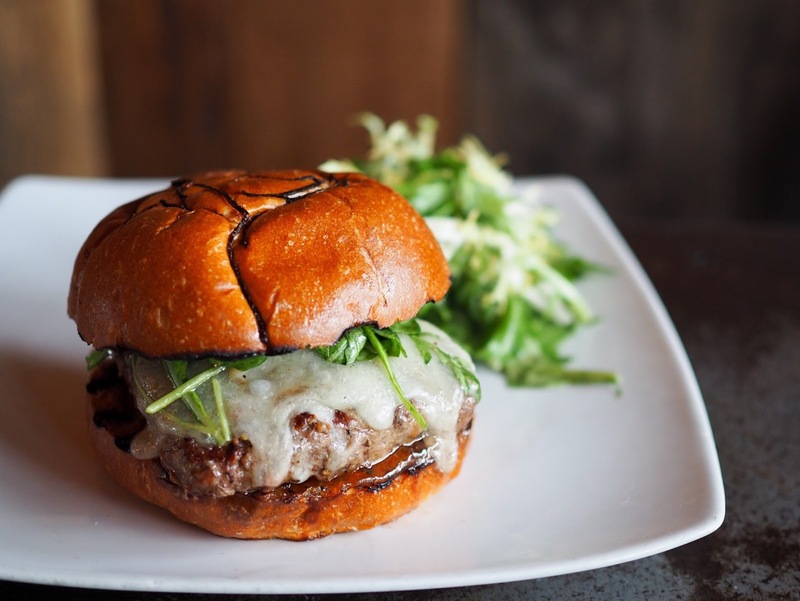 It also boosts one of the best burgers in LA, the Tripel Burger made with duck confit, pork & aged beef with a mild and soft truffle cheese, arugula and house-made apricot jam on an onion brioche bun. Savory, with a perfect hint of sweet, it’s well-balanced and a great alternative to a town full of thousand island-sauced burgers. Hawkins House of Burgers "The Whipper Burger"
Two large beef patties, cheese, lettuce, tomato, red onion, pastrami, and a hot link - that’s the Whipper Burger at Hawkins House of Burgers in Watts. Although this burger sounds over-the-top, Hawkins also makes no-fuss, unpretentious, and incredibly delicious burgers. The beef is fresh Angus, that's never frozen and is coarsely ground and formed by hand. The flavor of the beef patty alone is delicious enough to have without toppings, but why would you pass up on pastrami? The burgers are made to order and can take about 20 minutes to make, but it's worth it. The rookie on our burger list. Fritzi opened in the Arts District just a few months ago. Known for its wood rotisserie chicken, it is now also capturing our attention for its modest burger. Choose from three patty options: beef, turkey, or bacon-beef blend. Top it with fontina fondue, iceberg lettuce, calabrese relish and thousand island dressing. The bacon/beef blend is everything you can imagine with a smokey, delicious bacon flavor. Fritzi is attached to the new Arts District Brewing Company, so not only do you have a great burger you have great brews to choose from. The only question that remains, do you want cheddar potato waffles or tater tots for your side? It used to be under the radar, but not anymore. Inside a liquor store, in the back, past the beer and Lotto tickets, is the Standing Room - a very tiny counter where some of the best burgers in LA are served. These burgers rival your best fancy gastropub burger. The truffle parmesan fries are a must order and the burgers have a fusion thing going on with an Asian influence. The "Cash Burger" served with shishito pepper, bacon, cheddar, american cheese, onion ring, Korean aioli, and hoisin bbq sauce is an absolute flavor bomb. By now you’ve seen that you can get a very good burger in the most “unburger-like” places, including this Italian Steakhouse that makes the best Carbonara in town. If we’re not sitting at the bar ordering a plate of Bucatini Carbonara with a glass of vino, we’re having the Gold Label Burger made with premium beef and smothered with fontina, topped with bacon, arugula, onion & black truffle ketchup. Oh you fancy, huh? This burger pairs perfectly with a nice Italian red wine from their extensive wine list. The Gold Label Burger is definitely worth its weight in gold and the classic New York Italian Steakhouse vibe of Pistola is a plus. Plan Check Kitchen + Bar "Plan Check Burger (PCB)"
With three locations spread out from the Westside to Downtown, Plan Check Kitchen + Bar has you covered if you’re looking for a great burger. 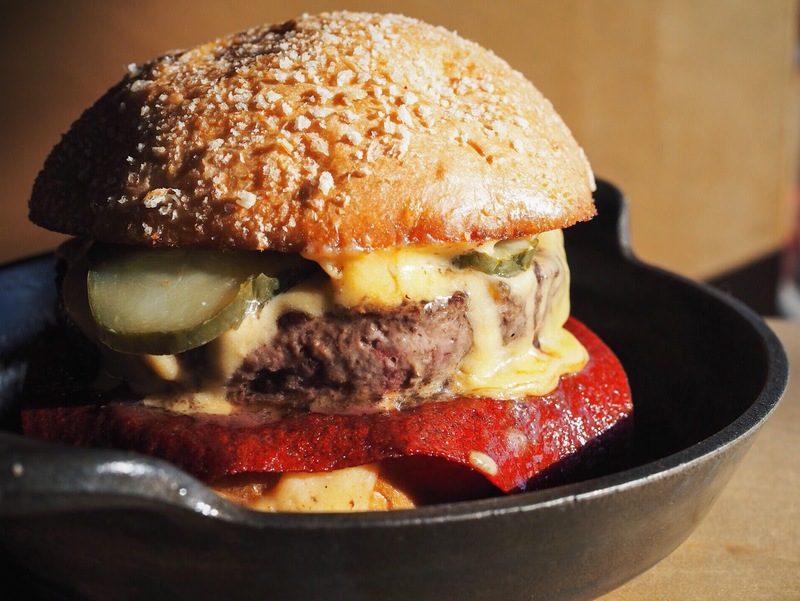 Their classic style burger, Plan Check Burger (PCB), is a wagyu beef patty with Americanized dashi cheese, schmaltz onions, pickles, and ketchup leather. Leather? Think of ketchup leather as a fruit rollup that melts into the beef patty so the bun doesn’t get soggy. It's a game changer and you'll never think of ketchup the same way again. Yes, technically there are other locations in Northern California, but the Fast Burger served at Grand Central Market and 3rd street locations are exclusive to Los Angeles. A drive-thru style, 3oz. grass-fed beef patty that’s similar in style to Shake Shack, is the burger you’ll want to order at Belcampo. It comes with toppings like lettuce, tomato, onions, American cheese, and house sauce. The single runs you just five bucks and a double costs $8. It’s a very delicious burger that’s sold at a bargain price - think of it as a fast-food style burger using gourmet ingredients. Belcampo is a farm and butcher shop first, and a restaurant second. The beef is always flavorful and the burger you’re eating has been in their hands from start to finish. It's a true farm-to-table experience.